Sorry I've been a little MIA. Jason & I went out of town for our anniversary, and work has been crazy since I got back, as we were in the midst of an office move. I just wanted to check in and give you a little pregnancy update. Seems like the question I get asked most is "how are you feeling?" Well, now that my ankle is (almost) healed, and now that the bad cold I had is (almost) gone, I feel pretty good. Oh sure, I could complain about how my stomach seems to think the only two possibilities are either extreme hunger or serious nausea, or about how I'm so fatigued I go to bed early at night & could easily nap during the day (if life would let me), how the extra blood beginning to course thru my veins leaves me short of breath at the smallest exertion, how round ligament pain sometimes stops me in my tracks, how pelvic rest leaving my husband and I very frustrated, or how within the past week my blood sugar has started dropping suddenly. But the truth is, that even with all that, I feel great. Wonderful. Happy. I love being pregnant. I have prayed for this child. I have waited for this child. I knew this child was meant for our family. How am I feeling? Blessed. I am feeling very, very blessed. The other thing that seems to be drawing attention is my belly. That's right folks, I "popped" at about 9 weeks. Now, I realize that it's bloat. I know the baby is a teeny tiny peanut and cannot possibly be making my belly that big yet. But I also know that with my first pregnancy my bloat turned straight into bump. I got big early, stayed big, then got bigger. I also have only gained 5 lbs, which would also be consistent with bloat (each month pre-pregnancy I gained between 5-7 lbs of water weight during my period). How a measly five pounds can turn into my giant belly, I have no idea. But it does. See proof below. And yes, other than a few pieces of my larger-size clothing that also have a lot of give, I'm wearing maternity clothes now. But I'm actually pretty pleased with my weight gain. You see, if you remember, the last time I went off my endocrine meds I blew up like a balloon. I don't recall exactly, and it may or may not be in my blog somewhere, but I want to say it was something like 25 lbs in three months. And since I had to stop the meds cold turkey the day I got a positive test, I honestly was fully expecting to put in 10 lbs or so in the first couple of weeks. But... nope. 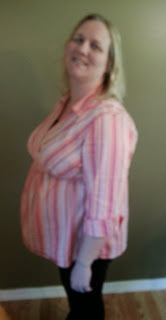 Stopped meds cold turkey + 10 weeks pregnant = 5 lbs weight gain. So I'm pretty happy with that. I also have a theory that my endocrine system loves being pregnant as much as I do and might actually be performing as it should. And I'm a little hopeful that maybe somehow this will set things right for me in the end. Wouldn't that be awesome? So that's my 10 week update. I'll try to get on here a little more often, but things have been pretty crazy, so no promises. Knowing of your previous trials with pregnancy, it is so good to see that things are going well thus far. Glad to see you are enjoying this as well. You deserve it; and I can't wait to hear more great updates! I'm so glad things are going well for you!